It was very pleasing to be able to play 25.Qxd6. This entry was posted on Saturday, March 5th, 2011 at 10:18 pm and is filed under Blog. You can follow any responses to this entry through the RSS 2.0 feed. You can leave a response, or trackback from your own site. Wow, spectacular! I wonder how quick you saw that black cannot take the queen back? I guess that black can only stop the mating threat (Rxf8) with 25. … Ne7. But i guess then 26. Rd1 finishes the game, not? I especially appreciate that you’ve posted a move that even we novices can appreciate readily. Your opponent must have had quite an interesting few seconds fully grasping the situation! 26.Rd1 doesn’t work because of 26…Nxd6, 25…Ne7 having removed the pin on the other knight. 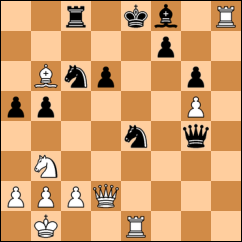 I think 26.Qd3 might be the best, as this should win the knight in a few moves. I must say, 25.Qxd6 is a very satisfying move, and probably better than 25.Qd5 which would win the knight right away (26.Rxe5, it can’t run since it’s pinned).